It may be one of the most confusing set of investigations going on. It's not just about one leak, it's at least three, all part of exclusive news reports happening within a two-week period. We know the FBI is investigating two of the unauthorized disclosures, one involving the report about a mole who helped thwart a Yemen bomb plot targeting the U.S. and the other about how the United States and Israel were behind Stuxnet, the mysterious computer virus that caused Iranian nuclear centrifuges to spin out of control. It is unclear whether there is an investigation of yet another story concerning the Obama administration's expansion of the drone program and how it determines which suspected terrorists will be targeted for a missile strike. Two congressional leaders say the Department of Justice's National Security Division had to recuse itself from one of the investigations, but we don't know from which one or exactly why. Rep. Mike Rogers, the chairman of the House Intelligence Committee, was the first to bring it up during a news conference Thursday with his committee counterparts. But it was Rogers' comment that raised some eyebrows. "DOJ National Security Division has recused itself from at least one element of the investigation, suggesting some of these leaks could have come from the sources within the DOJ or the FBI," said Rogers, R-Michigan. The Justice Department is not officially commenting, but one official offered an explanation for why it might be so. The official said prosecutors from the National Security Division's Counterespionage Section and FBI investigate classified leak cases, and National Security Division leaders and supervisors sometimes recuse themselves to "avoid even the appearance of a potential conflict of interest down the road." In practical terms, investigators would figure out all the people in government who had access to the information and interview them to look for who might have been the source of the leaks. If Justice Department national security officials might have been "read into" any of the classified matters in which there were leaks, they may be interviewed along with officials in the intelligence community and any other agencies who knew about the classified operations. If counterespionage prosecutors and FBI agents could have to interview their supervisors, it would not be appropriate for those supervisors to be be overseeing the investigation. So during the investigation, the agents and prosecutors would report to a different chain of command, which would not include anyone who might have had access to the classified material. "Such a recusal is a routine matter and in no way suggests any wrongdoing on the part of these officials," the Justice Department official said. "What is ironic is that such efforts to go the extra mile to be ethical and avoid even the appearance of a potential conflict are being portrayed as something sinister." Rogers later backed off his suggestion that the leaks could have come from within the Justice Department or the FBI. In a written statement later in the day, Rogers said, "I did not intend to suggest that this recusal implied that anyone in the division had improperly disclosed any information, but rather that the sorts of issues that can force a recusal show the serious complications facing the Department in investigating these matters." However, Rogers' original statement suggesting that the Department of Justice or FBI might have been the source of leaks continued to be reported by the media. 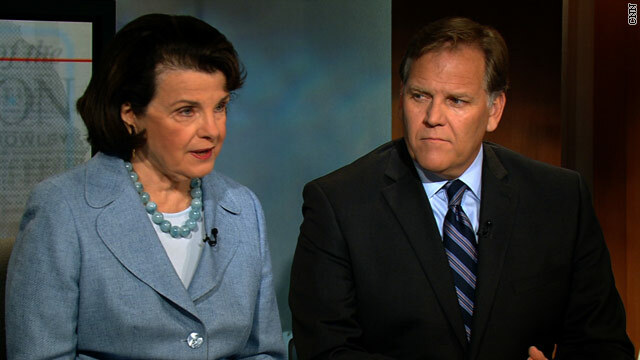 Sen. Dianne Feinstein, the chairwoman of the Senate Intelligence Committee, said she was aware of a recusal and she's OK with it. At the congressional leaks news conference, Rogers also said he found it troubling that the CIA had informed the Intelligence Committee Thursday morning that it could not respond to the committee's request for information regarding leaks. The congressman would not specify which leak his committee was investigating. In response, CIA spokeswoman Jennifer Youngblood said in a written statement, "We take seriously our responsibility to keep our oversight committees informed. There is absolutely no intent by CIA to withhold from our committees on the leaks issue. We all have to be careful not to jeopardize the DOJ criminal investigation that is running concurrently with the Congressional inquiry. We share Congress' concern and desire to get to the bottom of leaks and have every intention of cooperating fully with both DOJ and Congress." A representative for Rogers said the congressman does not buy that explanation and believes the CIA could support both investigations. Indian intelligence released a report stating that an advance part of the coding in FLAME was done in India. Israelis hired India to finish the FLAME virus. In the news article there is editorial error – there is this word "be" repeated. Please correct! If counterespionage prosecutors and FBI agents could have to interview their supervisors, it would not be appropriate for those supervisors to be be overseeing the investigation. Rogers is the only one who needs to be investigated- incompetent even for Michigan and about as clean as a mafia don. There's nothing political about outing Rogers' criminal acts or personal freak show- he has no place in a body that supposedly honors and creates the Rule of Law. The CIA is Top-Heavy with Republicans since GW Bush fired known Liberals within the Agency. How easy for a Republican-biased CIA to slip intelligence publicly then frame whomever their target is? Nixon used the CIA domestically (which is against Federal Law) numerous times so we know it has happened. Remember when Dan Rather lost his job because someone handed him info regarding GW Bush and his (lack of) military time? How quickly Republicans said "oh look, there's upper-case which weren't available on typewriters of that era", This was purposely done to Rather to end his career. Who hated Rather? Father Bush!! The author of one of the stories that broke this information in the NY Times was interviewed over the weekend. His response was that he had "reverse engineered" the information from other information that was leaked accidentally and innocently about 18 months ago, asked the admnistration if it would deny the same, and got no response. At least in respect of the present "leak" there is no faullt to be found. Too bad people aren't honest. Whoever leaked these things knows it was them. Step up and be a man. They are looking in the wrong place for whomever leaked this info. Start looking at the GOP! This has "Republican smear tactic' written all over it! SMEAR TACTICS? Information came out and it came from a White House source. Remember the is the same Administration who's mantra is "Never let a good Crisis go to Waste?? If Obama was a crook, Mitch McConnell and the GOP would have already had him impeached. The GOP followers just believe what they are told by the propaganda ministers. Mitt and the GOP keep spreading lies and smear campaigns. For once, I would like to hear an actual policy solution come out of thier mealy mouths. A.) "It's George Bush's fault"
B.) Need to spend more. The debt is how many times greater than his prececessor? We are still in Iraq, Afghanistan. For the Love of God. Romney could say NOTHING and be 1000% times better than Obama. The GOP has stated many times in the past that the economy did well under Clinton, because of things they did during Bush & Reagan. They stated that it takes 8 years for changes to take full effect. You can't have it both ways. Make up your mind GOP. The President needs to take a little responsibility for what goes on in his administration and run a tighter ship. He's also the president that refused to give up his own personal phone after taking office and he wants to claim that's not how they do business? The administration is built on hollywood. That he definately is!!! In fact, this President has more blood on his hands than all the members of the Chicago mobs put together, both past and present. In the next four years, he may even outdo the Mafia in it's 750 years of existance! Are the ducks being lined up to choose the guility? Someone's political career is finished in order to save the WH and its leader. I bet that Sen. John McCain is on the money this time. Barack Obama will stop at almost nothing to get reelected including leaking the fact that he's using those ungodly drones to kill people overseas! Sadly enough, it is now the politically popular thing to do which in turn proves just what a sick society we're now living in!!!! "Barack Obama will stop at almost nothing to get reelected"
Absolutely ridiculous tatement with no basis in reality. You must be thinking of Etch-A-Sketch boy. You know, the mexican immigrant. liberals name call and blame. what pathetic little children they are. don't forget that Obama thinks ACORN is a solid, upright organization and they committed fraud. C'mon George you're talking about the guy who picked Sara Palin to be his running mate. McCain is a fool. The best first question is who benefits? It doesn't really make Obama look good or bad so I don't see an obvious political angle. More likely someone in a three-letter-acronym group is involved. The denuclearization of South Asia (Subcontinent) particularly India is imperative. Quid pro quo transfer of nuclear technology by USA to third world countries such as India needs to be opposed on moral grounds. Billions of people live in that neighborhood and would be at risk from such catastrophes which I am sure the American people would not like to be a party to. We are all well aware that that region is prone to floods, earthquakes, tsunamis, and of course terrorism placing such nuclear installations at tremendous risks. US Congress is urged to reconsider and cancel all the agreements for the transfer of such technologies due “Force Majeure”. "Particularly India." Yeah right. Pakistan is just as big a threat as North Korea if not worse. Pakistan is only a nation in name only. 1/4 of Pakistan long ago seceded from the whole. Every time the media gets a story that source says refused to be named because he she is not authorized to discuss should be a huge red flag. Who is investigating why media allows this when they know darn well the information shouldn't be leaked? ..."Every time the media gets a story that source says refused to be named because he she is not authorized to discuss should be a huge red flag. Who is investigating why media allows this when they know darn well the information shouldn't be leaked?" Those that recieve the leaked data write books now, to make money off classified matters of national security. A book has been written by David A Sanger, Chief Correspondent for the New York Times that is a flood!! not a leak of classified matters of national security. It arrived yesterday. ...try Frank's Radiator Service: "A Good Place to Take a Leak". It safe to say every politicain in DC has sanctioned leaks, maybe not as serious as these but they do it for political purposes not the good of the country, All leaks should be investifgated and while the consequences may vary, it would be nice to know who is spurting out what. Of course better an honest leak than a misleading representation which is what they really excel at. Maybe the real reason the CIA, DOJ, and FBI recused themselves, is because they are investigating the Congressional committee members as the source of the leaks..or other members of Congress and do not want to tell the committee members..
People who have made a profession, a career, and lots of money, from talking....and plotting..